A landmark study published in the medical journal Fertility and Sterility, entitled Influence of Acupuncture on the Pregnancy Rate in Patients who Undergo Assisted Reproduction Therapy (Vol. 77, April 2002, 721-724) found that acupuncture dramatically improved the chances of becoming pregnant when used in conjunction with other assisted reproductive techniques. Reduces anxiety, stress and the hormones that are secreted during stressful situations that can significantly decrease fertility. Normalizes hormone and endocrine systems that regulate ovulation, especially in women with polycystic ovarian syndrome. Acupuncture and Chinese medicine can raise the fertility potential for women by affecting the quality, quantity, balance and flow of energy and blood. When energy and blood are abundant and circulating freely throughout the body, every cell, tissue and organ is properly nourished and functioning. When this occurs a women’s health and fertility are improved. According to traditional Chinese medicine or TCM, infertility is caused by an imbalance in energy and blood affecting one or more organ systems and meridians. The kidney system determines our genetic makeup and stores essence. Essence is produced by the genetic material we receive from our parents combined with that of the nutrient rich foods we eat. Essence acts to nourish our organs and can transform into energy. It there by regulates reproduction and female hormones. The spleen and pancreatic system involve the processes of metabolism. It functions to transform nutrients into blood and has a direct affect on the thyroid. Blood production has a fundamental connection with reproduction due its nourishing ability. The liver system acts to facilitate the free flow of blood and energy. It acts to metabolize hormones and its blood reservoir provides blood for menstruation. The liver is also responsible for the emotional flux associated with menstruation. An acupuncturist does not just treat symptoms and signs, but instead activates the body’s natural healing ability. It focuses on treating the root causes that have led to the problem or disease. It is completely natural, no drugs are ever used and this means side effects are rare. In conjunction with other assisted reproductive therapies, acupuncture can increase the overall effectiveness. It also acts as a form of preventive medicine, targeting the potential imbalances before they manifest into real problems. With some 5000 years of history it has withstood the test of time and modern medicine is only recently beginning to uncover why and how it works. Note: According to the World Health Organization, acupuncture has the ability to relieve labor pain, nausea, vomiting, and induces and decreases duration of labor. There is also strong evidence that acupuncture can help with breech birth. 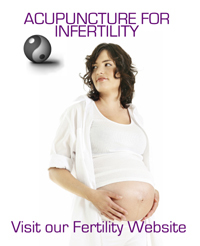 Please call us at 954-586-8088 to schedule a FREE CONSULTATION and learn more about how Acupuncture for Fertility works. You can also get more information including research and articles at our Acupuncture for Infertility website. CARE Wellness Center proudly serves the South Florida communities of Margate, Coconut Creek, Coral Springs, Parkland and Pompano Beach Florida.